John C. McGinley stars as Stan. As fans of the show already know, and as newcomers can see from the trailer, Stan Against Evil is set in the small town of Willard’s Mill, which has been a hotbed of supernatural activity for hundreds of years. Its unlikely defenders are Stan (John C. McGinley), the town’s crass ex-sheriff, and Evie Barret (Janet Varney), the current sheriff—with help and sometimes hindrance from Deputy Leon (Nate Mooney) and Stan’s daughter, Denise (Deborah Baker Jr.). Previous seasons have seen the gang take on various evil witches, as well as a were-pony, a demonic baby, a half-man/half-spider, and other beasties. “I have a lifetime of immersion in these [horror] things, so it’s always, ‘Oh we gotta do this!’ ‘We gotta do that!’” Gould said. But while the show is definitely wacky, it’s also careful to stay grounded, too. “John and Janet are real serious actors who built these characters before they even stepped in front of the camera. They asked a lot of questions of me about the past lives of these characters that forced me to become a better writer. It forced me to really sink the story’s support beams deep into the bedrock, and because of that it allows you to go many other places. 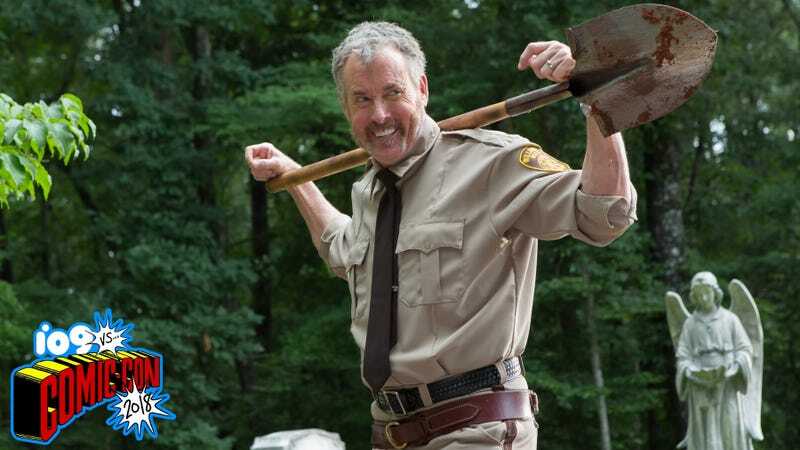 Stan Against Evil returns to kick off its eight-episode third season on—appropriately enough—Halloween night, October 31 on IFC.